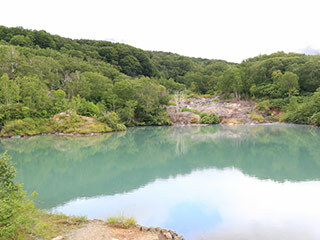 Jigokunuma Pond (地獄沼) is one of the hells in Japan located in Aomori Prefecture. It is a crater lake with high acid and extremely hot spring water. Therefore, there is no life in this pond. There is a parking and restroom at Hakkodasanbunen. Need a car to visit here. Drive 103 from Aomori to Towada. The 4,500 square meters crater lake was made by an eruption that occurred during the end of Volcanic activity of Mt. Hakkoda about 800 years ago. As highly acid hot water 90 degree C spouts out 2,700 litters per minute from the pond, the place is suited to fish habitat. Stay out of the pond as the bottom is covered with a thick layer of soft mud. The pond is dangerous.